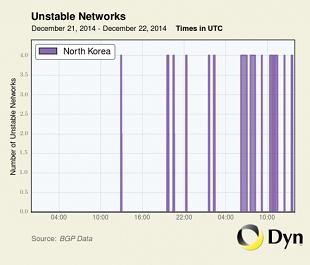 DPRK's limited Internet access is seemingly down for the count, according to researchers. Update: The odds of the United States being behind the outage are now even slimmer, as more information about North Korea's Internet access issues come to light. Arbor Networks has been tracking the country's network slowdown-turned-outage since Thursday night, which puts the start of the troubles before the U.S. formally named North Korea as the prime suspect in the Sony hack. "I'm quite sure that this is not the work of the U.S. government," says Dan Holden, over on the Arbor Networks blog. "Much like a real world strike from the U.S., you probably wouldn't know about it until it was too late. This is not the modus operandi of any government work." One group that is seemingly taking responsibility for the outage? 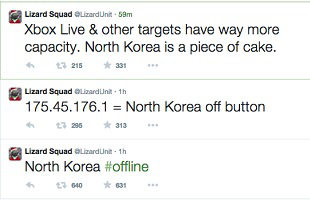 Lizard Squad, who also claimed responsibility for taking down Xbox Live and PlayStation Network earlier this year. So far, we've yet to see any official statement from North Korea, China, or the U.S. on the outage. Original Post: North Korea's already limited Internet access has been experiencing widespread outages and slowdowns, according to researchers monitoring the Web. Dyn Research, which monitors Internet access and speeds in countries around the world, says that North Korea's Internet access has been flat-out unavailable for most of the afternoon. "I haven't seen such a steady beat of routing instability and outages in KP before," said Dyn Research director Doug Madory. "Usually there are isolated blips, not continuous connectivity problems. I wouldn't be surprised if they are absorbing some sort of attack presently." Madory said the access problems started on Friday, worsened over the weekend, and culminated in a total outage earlier today. The last sentence is the key here, given the events of the last week. The FBI pointed to North Korea as the prime suspect in the Sony Pictures computer network hack, the aftermath of which caused the studio to cancel the release of The Interview (which they did a partial course-correction on earlier today). After North Korea was fingered as a culprit, President Obama said the U.S. would launch a "proportional response." There is no way to know if this outage is that response, unless the U.S. government admits as much (or if China or North Korea starts that conversation). The outage could be completely unrelated, or it could be tied to China, who brings Internet access into North Korea via its own connections (thus giving it some level of control over the access). It could even be a third-party hacker group, taking up some sort of hacktivist flag. Hopefully a clearer answer presents itself soon, and we will update accordingly if and when a cause is named.